T. H. (birth and death dates unknown). John Keim’s second son, Abraham Frederick Keim (born in Newport, Perry County, Pennsylvania on 7 July 1843) would later wed Julia Ann (Zeigler) Keim, who was born on 9 October 1840. On 20 September 1861, at the age of 43, John M. Keim enrolled for Civil War military service at Newport, Perry County, Pennsylvania. He then mustered in that same month at Camp Curtin in Harrisburg, Dauphin County as a Private with Company H of the newly formed 47th Regiment, Pennsylvania Volunteer Infantry. Military records described him at the time as being 5’7″ tall with brown hair, blue eyes and a light complexion. As part of the 47th Pennsylvania Volunteers, Company H became part of the federal service when it officially mustered into the U.S. Army on 24 September 1861. On September 27, a rainy, drill-free day which permitted many of the men to read or write letters home, the 47th Pennsylvania was assigned to the 3rd Brigade of W.F. Smith’s Army of the Potomac. That afternoon, they moved to the Potomac River’s eastern side and, after arriving at Camp Lyon, Maryland, marched double-quick over a chain bridge before moving on toward Fall’s Church, Virginia. Arriving at Camp Advance at dusk, they pitched their tents in a deep ravine about two miles from the bridge they had just crossed, near a new federal military facility under construction (Fort Ethan Allen). 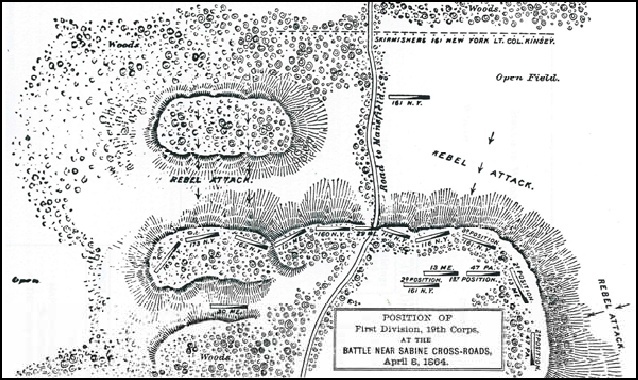 Armed with Mississippi rifles supplied by the Keystone State, they joined with the 3rd Brigade and Smith’s Army of the Potomac in defending the nation’s capital. Before he could make that trip, however, Private John M. Keim either fell ill or was injured. Discharged from Camp Griffin,Virginia on a Surgeon’s Certificate of Disability on 19 January 1862, he was sent back home to his family Perry County, Pennsylvania. Nearly eight months to the day of John M. Keim’s honorable discharge, John Keim’s son – Abraham Frederick Keim, resident of Newport, Pennsylvania, then enrolled for military service at Harrisburg, Dauphin County, Pennsylvania on 12 September 1862. His entry in the Civil War Veterans’ Card File at the Pennsylvania State Archives in Harrisburg provides no muster-in date or location, but does note that he was mustered as a Private with Company I of the 6th Pennsylvania Militia. His U.S. Civil War Pension Index listing, however, indicates that he served with Company D rather than Company I. Much of this is moot, though, because he was discharged from the 6th Pennsylvania Militia just over two weeks later. In 1863, at the age of 45, having recuperated from whatever illness or injury had plagued him during his time of service with the 47th Pennsylvania Volunteers, John M. Keim re-enlisted for another tour of duty. Re-enrolling at Bloomfield, Perry County on 26 November, he mustered in again with his same regiment – the 47th Pennsylvania Volunteers – at Camp Curtin in Harrisburg on 27 November. But this time, he entered as a Private with Company D. He rejoined his regiment from a recruiting depot on 10 December 1863. On 25 February 1864, Private John M. Keim and his fellow D Company men and 47th Pennsylvania Volunteers set off for a phase of service in which the regiment would truly make history. Steaming for New Orleans via the Charles Thomas, the men of the 47th arrived at Algiers, Louisiana on 28 February, and were then shipped by train to Brashear City. Following another steamer ride – to Franklin via the Bayou Teche – the 47th joined the 2nd Brigade, 1st Division of the Department of the Gulf’s 19th Army Corps. In short order, the 47th would become the only Pennsylvania regiment to serve in the Red River Campaign of Union General Nathaniel Banks. Rushed into battle ahead of other regiments in the 2nd Division, 60 members of the 47th were cut down on 8 April during the volley of fire unleashed by during the Battle of Sabine Cross Roads. The fighting waned only when darkness fell. Exhausted, those who were uninjured collapsed beside the gravely wounded. After midnight, the surviving Union troops withdrew to Pleasant Hill. Casualties were severe. Lieutenant Colonel Alexander was nearly killed, and the regiment’s two color-bearers, both from Company C, were also wounded while preventing the regimental flag from falling into enemy hands. Private Ephraim Clouser of Company D was shot in his right knee, and Corporal Isaac Baldwin was also wounded. Still others from the 47th were captured and held as prisoners of war until released during prisoner exchanges in July and November 1864. At least two of those POWs never made it out alive. 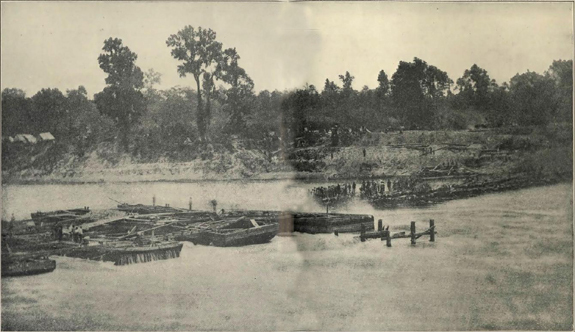 Christened “Bailey’s Dam” for the Union officer who ordered its construction, Lt. Col. Joseph Bailey, this timber dam built by the Union Army on the Red River in Alexandria, Louisiana in May 1864 facilitates passage of Union gunboats. Photo: Public domain. On 16 May, D Company moved with most of the 47th from Simmsport across the Atchafalaya to Morganza, and then back to New Orleans on 20 June 1864. On the 4th of July, they learned their fight was far from over. Still able and willing to fight after their Bayou battles, the soldiers of Company D and their fellow members of the 47th Pennsylvania’s Companies A, C, E, F, H, and I boarded the McClellan and steamed away for the East Coast on 7 July. Following their arrival in Virginia and a memorable encounter with President Abraham Lincoln, they then joined Major-General David Hunter’s forces in the fighting at Snicker’s Gap and, once again, assisted in defending Washington, D.C. while also driving Confederate troops from Maryland. Attached to the Middle Military Division, Army of the Shenandoah in August, early to mid-September saw the departure of several 47th Pennsylvania Volunteers who had served honorably, including Private John M. Keim, who was discharged again on a Surgeon’s Certificate of Disability – this time from Berryville, Virginia on 4 September 1864. Back home in Pennsylvania, John M. Keim resumed his life with wife, Narcissa, and their children. Just over four months later, on 31 January 1865, John M. Keim’s son – Abraham Frederick Keim – re-enlisted again for military service, this time re-enrolling and mustering in at Philadelphia, Pennsylvania as a 22-year-old Private with his father’s old company and regiment – Company D of the 47th Regiment, Pennsylvania Volunteer Infantry. Military records at the time of his re-muster indicate that he had been born in Newport, Perry County, Pennsylvania, and that he was employed as a clerk. These same records described him as being 5’4″ tall with brown hair, gray eyes and a fair complexion. The 47th Pennsylvania Volunteers had been stationed in Virginia since their participation in legendary Union General Philip H. Sheridan’s 1864 Shenandoah Valley Campaign. By the time that Private Abraham F. Keim joined up with his company and regiment, their fighting days – while not completely ended – had begun their transformation into what would end as peacekeeping and Reconstruction. * A letter about Company D, 47th Pennsylvania Volunteers, which was reprinted in the New York Times on 30 April 1864, pointed to an interesting fact: By the Spring of 1864, Company D’s roster had included multiple family groups – two Anthony, three Baltozer, four Brady, two Clay, two Charles, two Fertig, three Kosier, two Reynolds and two Vance brothers; three Harper brothers who were also brothers-in-law of the company captain (Captain Henry D. Woodruff); the Powells and Shaffers (five brothers and a cousin, and two brothers and a cousin, respectively); and the Tag/Taggs (a father and two sons). The father and son Keims, while not mentioned in this newspaper notice, were also part of D Company’s fascinating familial makeup. Assigned in February 1865 to the Provisional Division of the 2nd Brigade of the Army of the Shenandoah, the men of the 47th were moved, via Winchester and Kernstown, to Washington, D.C. where, on 19 April, they were responsible for helping to defend the nation’s capital following the assassination of President Abraham Lincoln. Encamped near Fort Stevens, they received new uniforms and were resupplied. On either 23 or 28 May 1865, Private Abraham F. Keim was again discharged, this time mustered out by General Order No. 77, issued on 28 April 1865 by the U.S. Office of the Adjutant General. After his honorable discharge from the military, John F. Keim returned home to Perry County, Pennsylvania where he continued to reside in Newport with his wife and children In 1870, John and Narcissa Keim lived there with son, Oliver (listed as “Otis” on this census), and daughter, Margaret. By that year, John M. Keim and his son, Oliver/Otis, were engaged in a dry goods business, which suffered a transition on 11 June 1872 when Oliver/Otis passed away, and was interred at the Newport Cemetery in Newport, Perry County. By 1880, John and Narcissa were still residing in Newport with daughter, Margaret. Another of their sons, Abraham or Zachary, had also joined the family. This was most likely Zachary since Abraham had married and begun his own family by this time. In 1880, John M. Keim was employed as a farmer while Zachary worked as a laborer. On 16 January 1888, John widowed Narcissa, passing away in Newport, Perry County, Pennsylvania. He was interred at the Newport Cemetery. Narcissa passed away 11 years later on 28 March 1899, and was also interred at the Newport Cemetery. Following the close of the Civil War, John M. Keim’s son – Abraham Frederick Keim – who had enlisted with and honorably mustered out from John Keim’s old regiment, also returned home to Perry County. There, Abraham F. Keim and his wife, Julia Ann (Zeigler) Keim, welcomed to the world sons, Harry T. Keim (1870-1927) and Charles P. Keim (1877-1942). On 16 January 1906, Abraham Frederick Keim passed away in Newport, Perry County, Pennsylvania. He was interred at the Newport Cemetery in Newport, Perry County. His wife, Julia (Zeigler) Keim was also interred there after passing away in Newport on 29 September 1920. 2. Civil War Veterans’ Card File (“Keim, Abraham F.”, “Keim, John M.’ H-47 I” and “Keim, John; D-47 I”). Harrisburg: Pennsylvania State Archives. 3. Pennsylvania Veteran’s Burial Index Card “Keim, John; Newport Cemetery, Newport, Perry County, Section C2, Lot 142, Grave 90; 47th Regt., Co. ‘D’, 11/27/1863-9/14/1864”). Harrisburg: Pennsylvania Department of Veterans Affairs. Keim, Abraham F., application no. : 1050258, certificate no. : 468324, filed from Pennsylvania by the veteran on 19 August 1891; application no. : 842843, certificate no. : 648610, filed from Pennsylvania by the veteran’s widow, “Keim, Julia A.”, on 8 February 1906). U.S. Census (1870, 1880); U.S. Civil War Pension Index (veteran: “Keim, John; H, 47 Pa Inf”; widow: “Keim, Narcissa”; application no. : 140673, certificate no. : 172880, filed by the veteran on 10 March 1869; application no. : 369412, certificate no. : 246801, filed from Pennsylvania by the veteran’s widow on 20 March 1888).